To create a social impact with sport is part of Decathlon’s philosopy. We’ve been enjoying a very funny and healthy relationship with the oxelo team in Bangalore and Lille over the last 1.5 years on various occasions. Our common journey started when their entire team reached Janwaar in November 2016 for our first skateboarding competition. They not only enriched the competition with their skateboarding skills, they also brought us skateboards and added their fair share to make the competition a fun experience 🙂 What evolved since then I only can describe as a mutual understanding of how sports can drive change and have a significant impact on peoples lives – outside the big (and small) cities. So only recently we expanded our partnership on bicycles – thank you Mayank and Raghu. 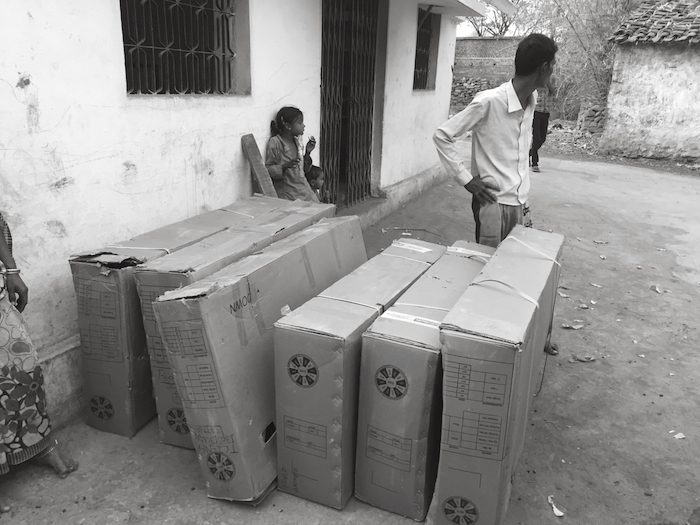 It was not so easy to get the six bikes from Delhi to Janwaar … Emotions were flying high among the kids and in Ramkesh’s familiy where the bicycles should find their new home. Almost every day the kids were asking: “When will the bikes arrive?” Finally last week the day had come. Since it is not so easy to get something delivered to Panna – Panna is still an area where no courier services delivers to – we had to go the usual detour via Satna and then arrange a private pick-up from there. And here they are … two smaller bikes for kids, two town bikes and two gear bikes for cross country. One can see the excitement and happiness in Ramkesh’s face while watching his father and Pappu assembling the bikes. Ramkesh’s father receiving the bicycles. Ramkesh’s father and Pappu assembling the bikes in their small stall. Ramkesh roaming around on the bike in their courtyard. If everything works out well these bikes will become a new source of income for Ramkesh’s family. They are struggling just above poverty line. The idea is that all our guests and volunteers who are coming to Janwaar, some of them stay for a couple of weeks in our homestays, can rent a bike and so easily make their way to Panna and be independent of the auto which commutes only twice a day between the village and the town. Furthermore they can explore the challenging yet inviting landscape around the village: fields, jungles, wild animals and even some lakes along the unpaved routes. We’ve laid out a few tracks (up to 30 km) around Janwaar. The kids are happy to show them around. 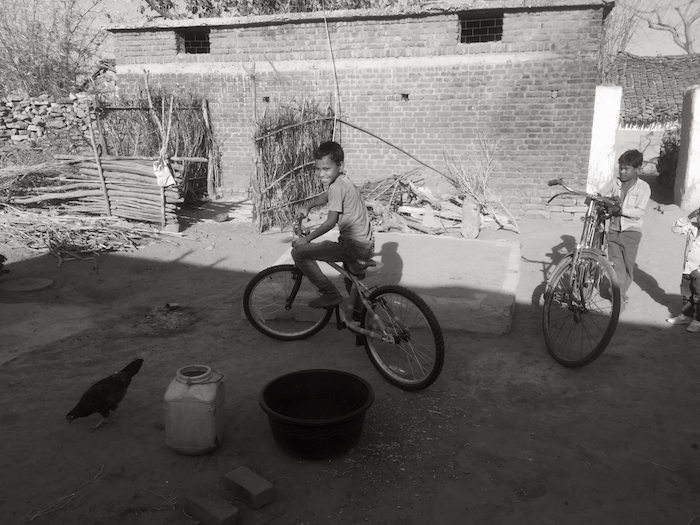 Parts of the income will stay with Ramkesh’s family, who is responsible for the bicycles (maintenance, repair, cleanliness), and parts of it will help us to buy fruits for the kids at the Anganwadi. Many of them are malnutrioned and need extra food. Before even a bike is rented they are having already a significant impact. Ramkesh’s father who is suffering from TB is now constantly smiling. He takes his “new” job very responsibly and his self-confidence has tremendously increased. His entire body language has changed. 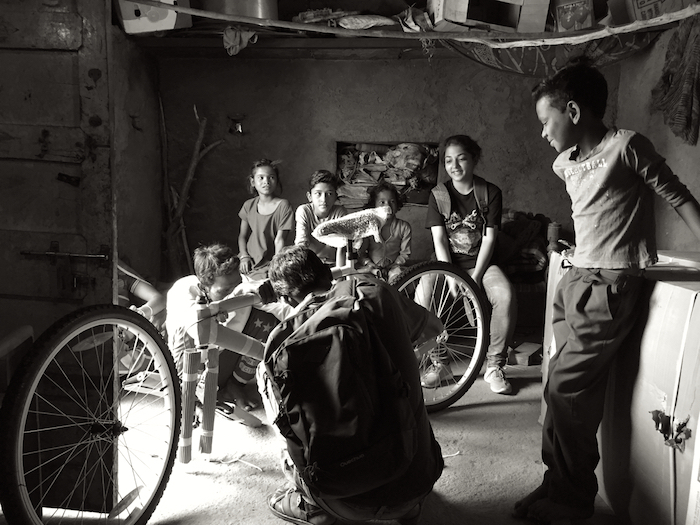 A small stall, which can only be entered from their court, is the “garage” of the new bikes – it has become a treasure hall for the family and the village. So far the kids are allowed to accompany the visitors on their trips – and from what I’ve heard (I am out of village), yesterday they’ve had the first rental. Billie, a skateboarder from UK, is honoured to be our first “customer”. More on this soon.